A tribute to my friend Joe whose memory I keep always. Happy St. Patrick’s Day to all. 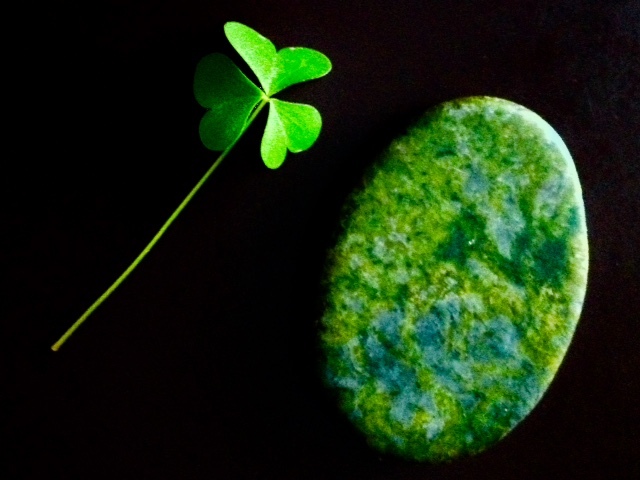 I am not superstitious by nature, but this lovely, simple symbol of my Irish heritage is never far from my side. In fact, I keep it tucked in a small zippered compartment of my purse. Made from Connemara marble, the Irish Worry Stone so smooth and cool to the touch, is reputed to keep worries at bay and bring a sense of comfort to those who hold it. My mother loved these worry stones and often brought them back to friends as souvenirs when she visited her homeland of Ireland. My close friend Joe, who was diagnosed with Non Hodgkin’s Lymphoma at 32 years of age was the recipient of one of my mother’s worry stones. When he died, I visited his apartment where his mother was staying temporarily. As we comforted each other with memories of her youngest son, she asked if she could show me something. Entering his bedroom she gestured toward his night table. On the corner closest to his bed, lay the worry stone. I like to think that it brought him comfort. I am not superstitious by nature, but this lovely, simple symbol of my Irish heritage is never far from my side. In fact, I keep it tucked in a small zippered compartment of my purse. Made from Connemara marble, the Irish Worry Stone so smooth and cool to the touch, is reputed to keep worries at bay and bring a sense of comfort to those who hold it. My mother loved these worry stones and often brought them back to friends as souvenirs when she visited her homeland of Ireland. My close friend Joe, who was diagnosed with Non Hodgkin’s Lymphoma at 32 years of age was the recipient of one of my mother’s worry stones. When he died, I visited his apartment where his mother was staying temporarily. As we comforted each other with memories of her wonderful son she asked if she could show me something. Entering his bedroom she gestured toward his night table. On the corner closest to his bed, lay the worry stone. I like to think that it brought him comfort. Daily Post Photo Challenge "Vivid"